There are many activities to choose from at Wesleyan Woods. 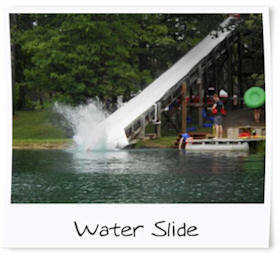 A 100′ sandy beach on the lake, 49′ water slide, canoes, catch and release fishing, playground, double court sand volleyball, horseshoes, carpet ball, disc golf, blacktop basketball court, 13 element high ropes course, 45′ rock climbing wall, putt-putt golf, a “wet” zip-line, and a “dry” zip-line. 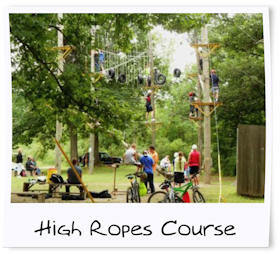 Other activities include several nature trails going throughout the property, bonfires, and wagon hayrides. Some of these activities are operated by staff and are open only at scheduled times. Please Note: Staff Operated Weekend Activities are only available from Memorial Day until Labor Day Holiday Weekends. 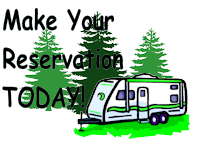 **For RV campers and groups, Staff Operated weekday fee based activities may be available for a group of 10 or more by appointment during the week. Price is $25 per person. Contact office for more details. * Please Note: There is a Lifeguard on duty at the water slide and dock. There IS NOT a lifeguard at the beach. Under 16 needs to be supervised by an adult & MUST have a life Jacket on if swimming outside of shallow area. Signs are posted. Those participating in any camp activities must sign a Liability Waiver. The Liability Waiver form can be filled out upon arrival.